At Festo, we know that the UK manufacturing industry is facing a challenging time of rapid change. 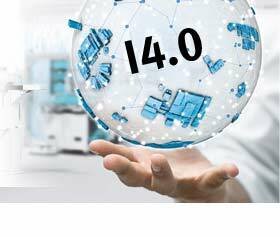 In these resources, we share our expertise, insight and comments on introducing Industry 4.0. Whether it’s new technology and production processes or man/machinery interaction and training. We need to proactively manage this change. We need to keep ahead of the curve. Leadership 4.0 looks at the leadership capabilities and qualities that will be required in the new factories of tomorrow. There are five changes to the environment that will change the direction of leadership in the future. Find out about our training for manufacturers and engineering organisations on Industry 4.0. Our extensive White Paper supports leaders and managers to effectively plan ahead. Make sure you have the knowledge you need to overcome the challenges of Industry 4.0. If you missed them, there’s still time to catch up on the recording. Use our Quick Check tool to get an indication of your company's digital maturity. Following completion of a series of quick questions you will then automatically receive a handy evaluation report including recommended actions to assist you. Ensure you are well prepared for Industry 4.0 by downloading our infographic and White Paper below. We have produced an extensive White Paper, on the topic of Industry 4.0 that will enable leaders and managers to effectively plan ahead to ensure that you are facilitated with the knowledge to overcome the challenges that Industry 4.0 will present.